Glazing kitchen cabinets is also known as antiquing. This is the process of artificially aging the way a cabinet looks by applying a glaze to make a weathered appearance. It can only be done on painted cabinets because stained cabinets will repel the glaze mixture and will therefore show no effect. A glazing project can be completed by virtually anyone with a little do-it-yourself experience who follows the proper technique to achieve the look. 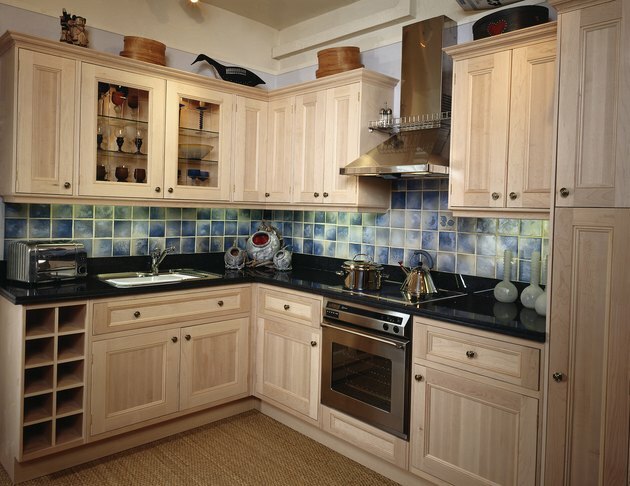 Glaze your kitchen cabinets for an antique look. Remove all of the hardware and the hinges from your kitchen cabinets with a screwdriver. Lay the removed cabinet doors down on a table that has been covered by a drop cloth. Wash the cabinets using a soapy dishwater solution. Use a rag or sponges to wash and then rinse the cabinets. Cabinets around stoves might need to be degreased with a degreaser after washing to remove cooking oils. Once degreased, wash and rinse the cabinets and allow them to dry. Mix up a glazing solution in a bowl. A glazing solution will consist of latex glaze mixed with latex paint. The color of the paint should compliment the color of your kitchen. For example, if you have brown accents, use brown paint mixed with glaze. If you have gray countertops, use gray paint mixed with glaze. If you want a neutral glaze color that goes well with any kitchen motif, use black paint. Ultimately, this is a subjective process that relies on your personal taste. Add in 1 part of paint to 3 parts of glaze for a light glazing solution. A medium glazing solution will be 1 part glaze to 1 part paint, and a dark glazing solution will be 3 parts paint to 1 part glaze. Mix the glazing solution well with a paint stick. Dip a rag into the glaze and apply it on small sections of the cabinet or the doors. Rub it vigorously onto the surface and then gently wipe it off with another rag. The more pressure you use wiping off the glaze, the less glaze that will remain on the surface. You can apply it in long vertical or horizontal motions for a more streaked look, or apply it in a circular motion for a more swirled look. Feel free to experiment for the way that looks best to you.